Two great double bills for KXCI Presents! shows Friday and Monday. Friday finds Andrew Bird and Laura Marling at The Rialto Theatre. Longtime KXCI favorite Andrew Bird and band are touring behind their newest release, Break It Yourself. All concert tickets will be bundled with this new release and two live EP's. England's new folk sensation, Laura Marling opens this all ages show with doors at 7pm. Monday, April 23rd, it's another great double bill with Bon Iver and Feist at the TCC. Both groups have been mainstays of KXCI DJ's and listeners for years but are now getting widespread acclaim. Bon Iver just won two Grammy's for Best New Artist and Best Alternative Music Album. Leslie Feist has been making great music and steadily amassing accolades since her 2004 debut. 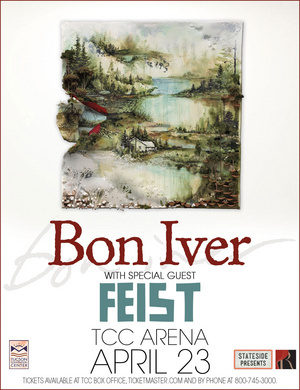 Doors open at 7:30pm with Feist for this all ages double bill at the TCC Arena. More information at Stateside Presents.